What we need to remember is that the Heller decision was decided by only one vote. The true power of the Presidency and the Congress lies in their nomination and approval of the Judiciary at the Federal Court and Supreme Court level. The next four to eight years will see up to three Supreme Court seats open up and many more Appeals Court openings. Who is in power will determine who is put into these open seats. And this doesn’t even count the lesser federal judge positions all over the country — positions filled by the President, and from which Supreme Court justices likely will come. This is also a year when pragmatism simply must overcome principle for some voters. There are many out in this great country of ours who would prefer to vote, “none of the above.” Many who are considering voting Libertarian as a means to register their frustrations. Please don’t! A vote for anyone other than the McCain – Palin ticket is a vote for Obama – Biden and a vote to destroy your Second Amendment rights. This is too close an election with too much at stake to make a protest vote. If we want “a Sharper Future,” we need to elect a ticket that not only believes in our rights and freedoms, but has a chance to win. Third party candidates cannot win. We cannot afford to give the election to Obama – Biden. Knife Rights is supporting McCain – Palin because they will support our rights and freedoms, it’s that simple. This year, more than ever, if you are concerned about your personal rights and freedoms you need to vote and make sure your vote will count. These precious rights are threatened more than any other time in our lives. Vote for your freedoms, vote for “a Sharper Future,” vote McCain – Palin. England remains the poster child for how bad things can get for knife owners. British society has turned against knives with a vengeance, led by sensationalist media and driven in part by serious social problems that have manifested themselves in what the Brits call “knife crime.” Reading about it is one thing, experiencing it is another. I got the chance first hand just a few weeks ago. I recently spent a week in Portsmouth, RI, and then another week in Portsmouth, England, participating in open water life raft tests (for the Equipped To Survive Foundation). The differences were more than a bit scary. Over here in the U.S., most of the active participants in the testing carried a pocket knife of some sort, exactly what youâ€™d expect from sailors and the like who work and play on the water. A few questions were asked about the knife I carried, one they were not familiar with. But, it was treated as the tool it was, and that’s it. Fast forward two weeks to the UK. I was the only person on board with a knife. Had I not had one, weâ€™d have had problems; it got lots of use during the course of the testing. What was more striking and ever more terrifying to me was the reaction from most of the others when I first pulled out my perfectly UK legal 3-inch pocket knife. Youâ€™d have thought I had just pulled a severed hand out of my pocket by the reaction of some of the participants. The reaction was disturbing on many levels, but testament to how far the Brits have fallen culturally and societally. Experiencing this sort of anti-knife phobia first hand reaffirmed the need for Knife Rights. If we don’t fight for our rights, this is what can happen over here. Depending upon the results of the upcoming election, it may become an even greater concern. Support the fight for our freedoms and a Sharper Future. Knife Rights’ plan to attend Blade Show West was sidetracked by an invitation to attend the 23rd annual Gun Rights Policy Conference put on by the Second Amendment Foundation and the Citizens Committee for the Right to Keep and Bear Arms. It was a unique opportunity to remind leaders of a variety of Second Amendment related groups that itâ€™s our Second Amendment too! The good news is that I and Knife Rights received a warm and supportive welcome. More than a few attendees noticed the Knife Rights logo on my shirt and came up to me to introduce themselves as Knife Rights members or to ask about the organization. It was nice to feel appreciated and to find our interests resonate with others. While not every knife owner is a gun owner, with rare exception, gun owners are knife owners. They have been fighting for their Second Amendment rights for a long time and they understand. 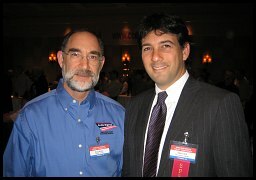 The photo shows Knife Rights Chairman Doug Ritter with attorney Alan Gura of Heller Decision fame. We are also working on some exciting new developments for implementation next year. Please stay tuned.